At Edison Electra, we give you both. Our Monocoque structure is robust and more reliable in case of a collision. Our light weight design with aluminium structure gives better agility and more mileage compared to GI and other structures. Our lightweight design allows us to be most efficient in terms of utilizing kwh. Our buses deliver the most kilometers per kwh and hence remain the longest range buses available anywhere in Asia on a single charge (680 kms). Our Monocoque design has been proven to absorb more impact in case of a collision and the bus body doesn't fall apart as in case of a chassis design. 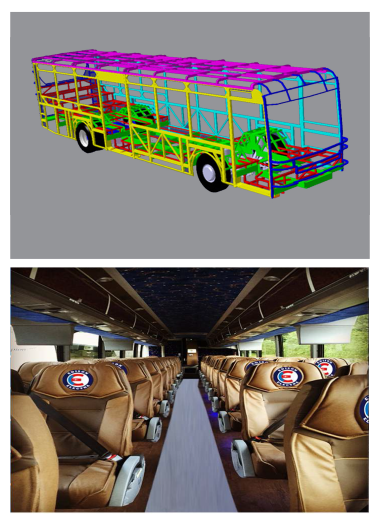 Monocoque design acts more like a monolith of rock where the whole structure of the bus acts as a single unit as opposed to upper body and lower chassis of traditional designs. Our buses give you the comfort and luxury of a long distance coach while giving the peace of mind offered in ICE buses. We give you the best of both worlds.